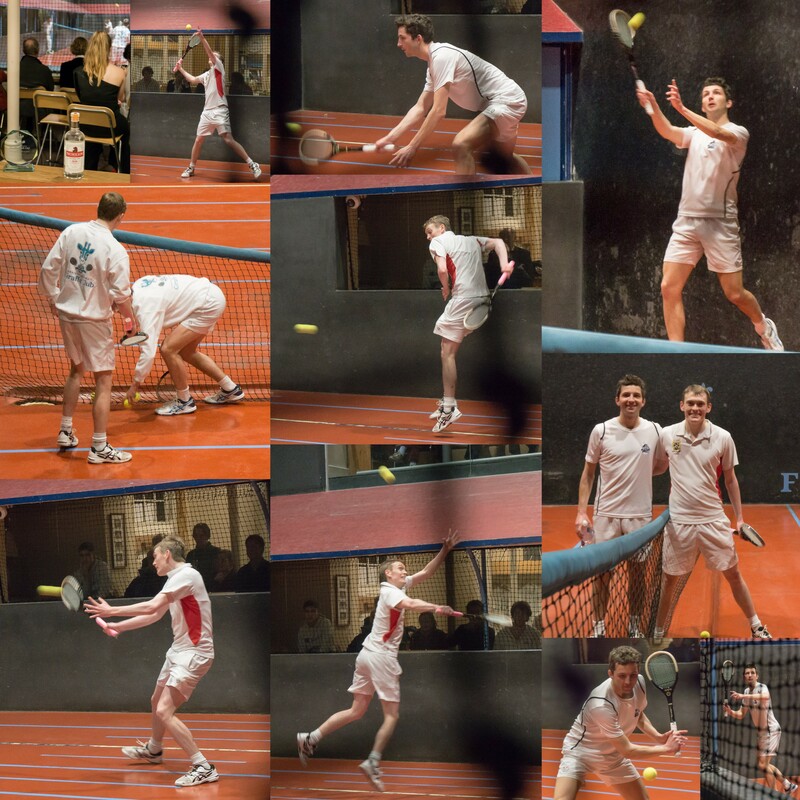 On 13th February Cambridge hosted the latest East Anglia Pennant fixture v Prested Hall. This was a big fixture as Prested were sitting at the top of the league before this match. Oliver Brenton played a great singles match and showed good focus and determination to win 6-4 against Graham Wilcox. Ben Geytenbeek then fought hard but lost 4-6 to Adam Dixon-Smith. Ben and Oliver had a blinder of a doubles match against Graham and Adam. 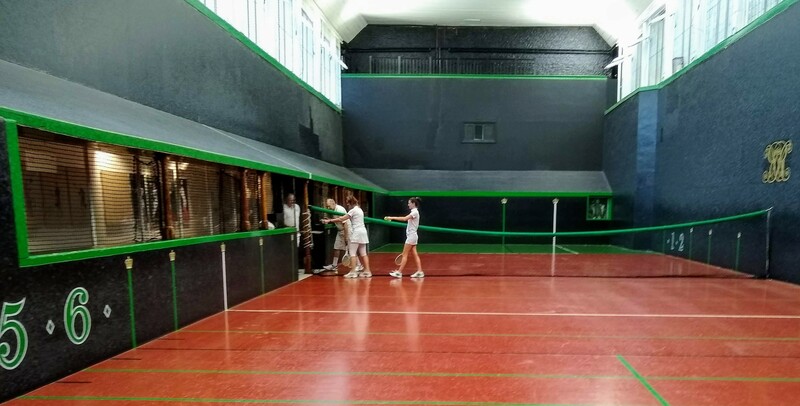 It went all the way to 5 all, 40 all, and having the best rally of the whole match on that point, won 6-5 to take a crucial match for Cambridge. 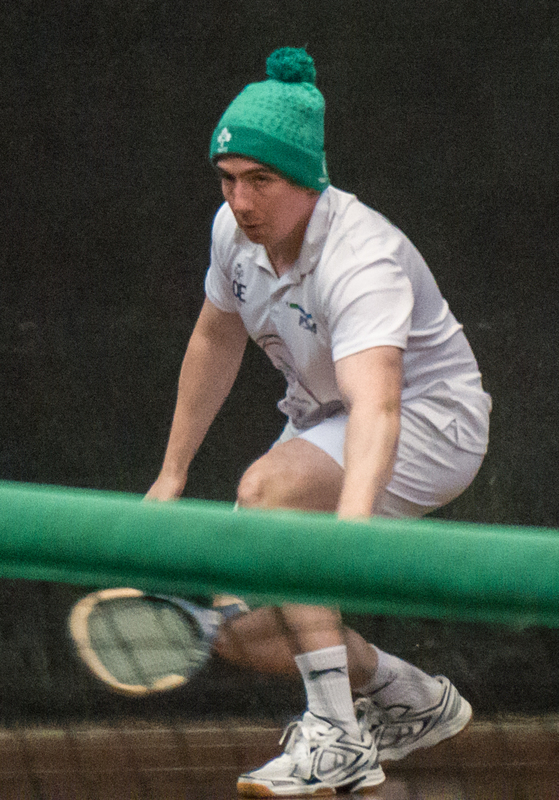 In his singles, Julian Stafford had a close match with Richard Ramjane, and Julian edged ahead to clinch a win 6-4. 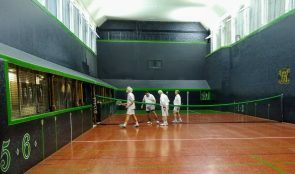 Jim Ludekens faced a tough opponent with a stylish game in his singles where Brian Muir dominated and secured a singles win for Prested 6-2. 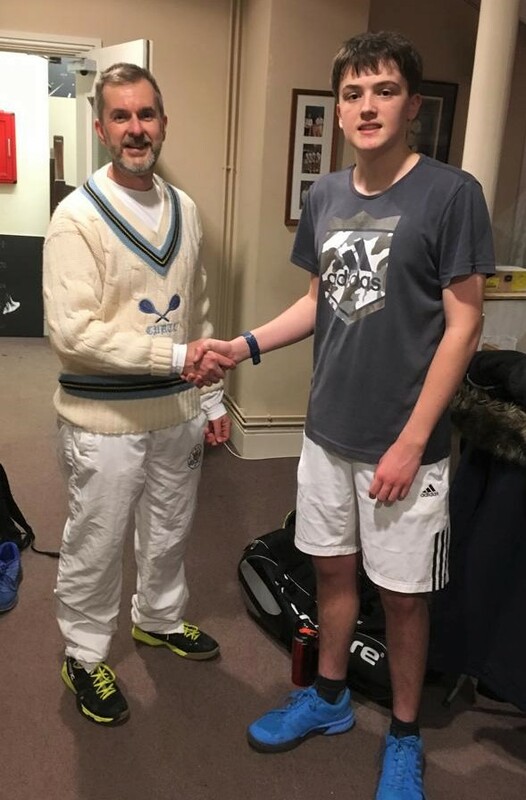 Julian and Jim were successful in their doubles, Julian was solid throughout the match and although Jim had a few shaky periods, they finally conquered the opposition 6-5. 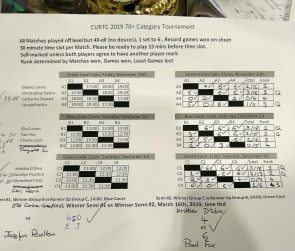 So, the overall score came out as a 4-2 victory for Cambridge. Cambridge are currently second in the league table with one final fixture to go; a home match against Newmarket on 13th March. We are looking for a big victory! Please let us know you are watching by posting a comment or two on the YouTube page! 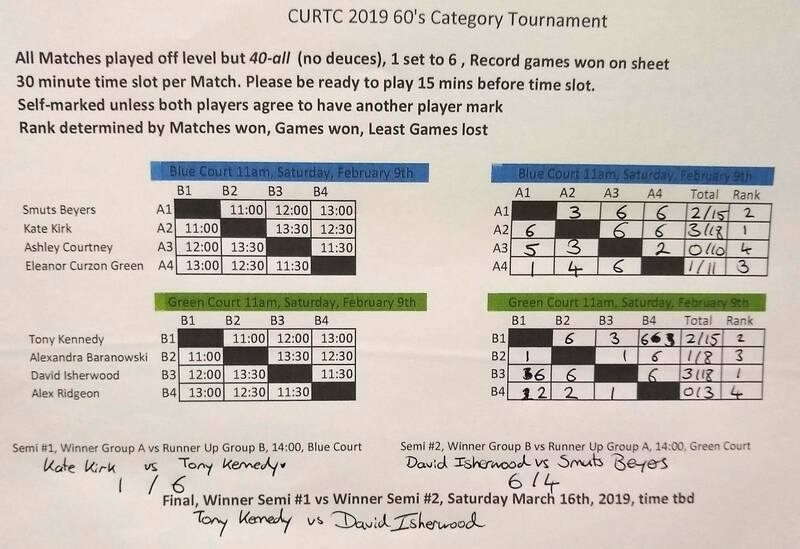 Congratulations to Dave Isherwood and Tony Kennedy who will contest the 60 Category Final on Finals Day, sponsored by Hannay Robertson Financial Planning, on Saturday, March 16th. 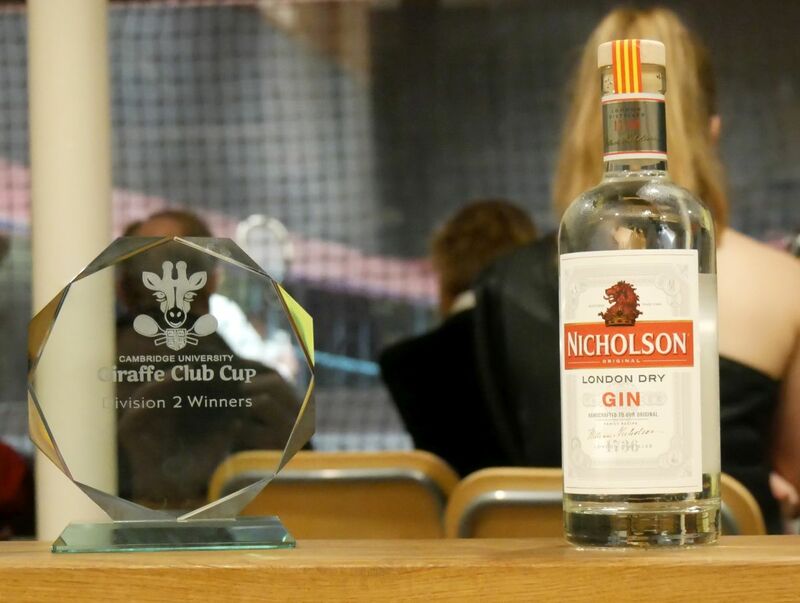 Thanks to Niholson Gin for their…. 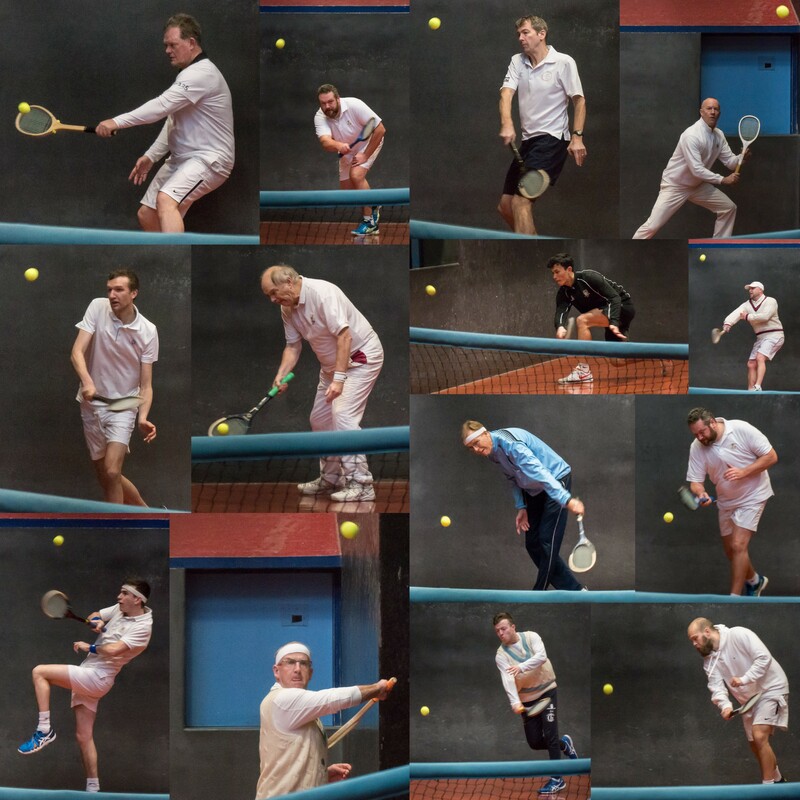 The handicaps were high but so was the entertainment value of the tennis on offer. 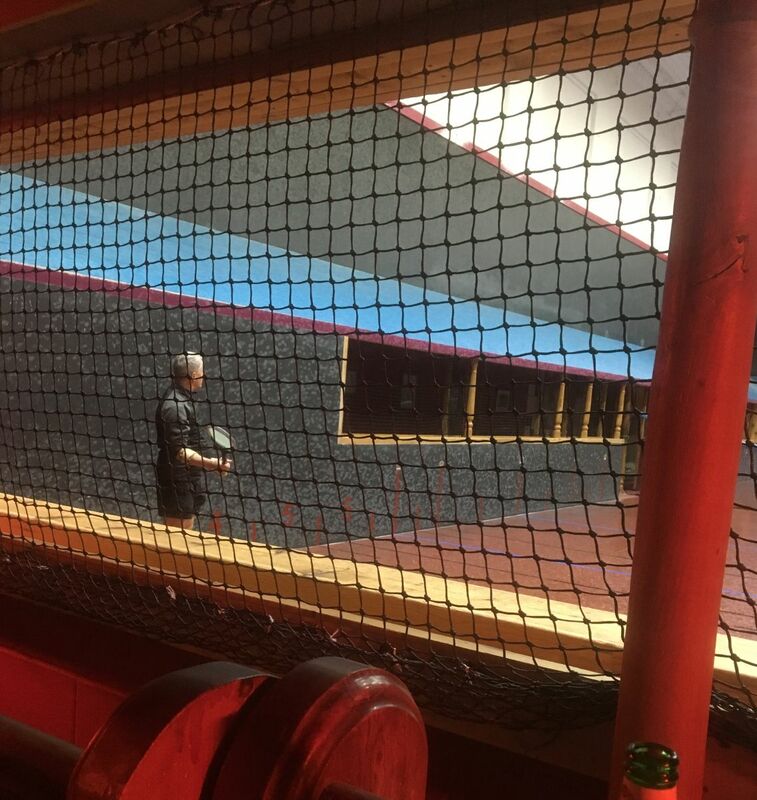 That it came down to the last game of the day’s last match to leave a six all draw was somehow fitting. A day enjoyed by all. 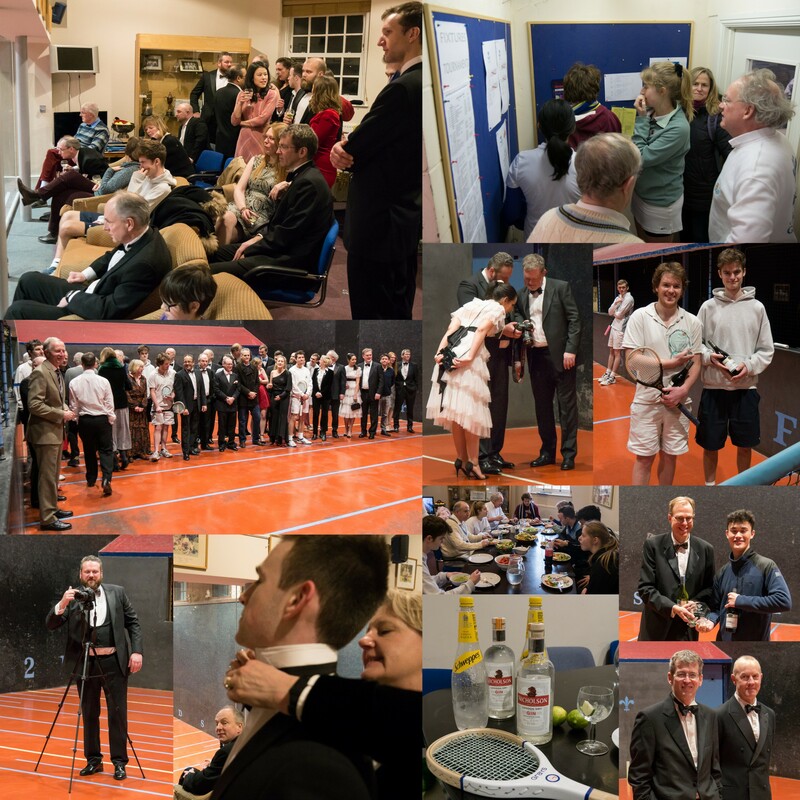 5 of the 12 matches went the full distance and 2 more were only one game short of the maximum. So the handicap system seems in good shape but the schedule did suffer! 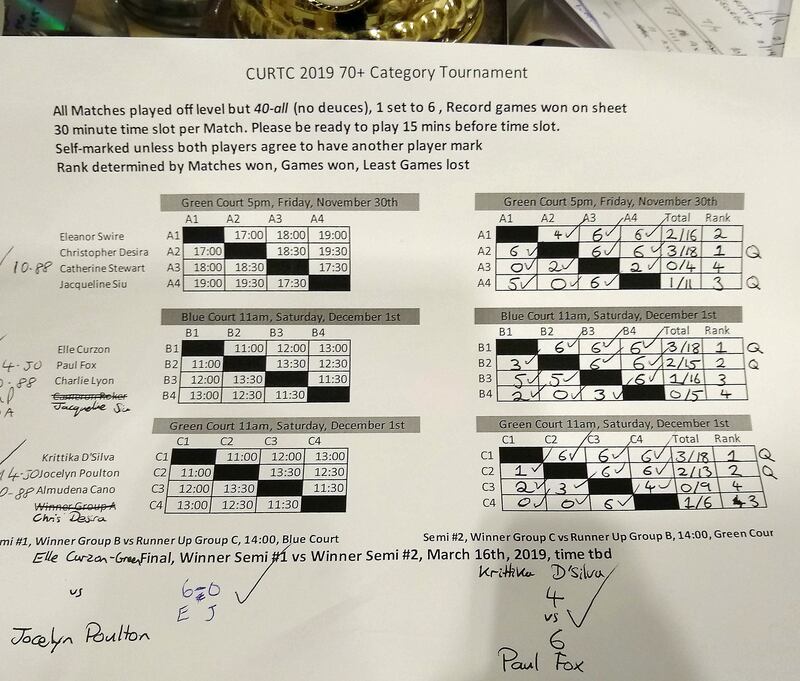 At the end of it all, CURTC had managed to reverse the orange tide which had engulfed us over the past two years. But it did take a considerable number of games to do so, I reckon the entire match comprised of very nearly 90% of the maximum possible number of games! Picking out even a few highlights is impossible but I’ll do it anyway. Our Doubles went to 40-all in the last possible game. At no point was either pair ahead by more than two games and the lead changed at least 4 times. 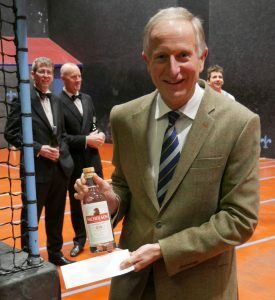 We only won when we finally managed to induce a volleying error from our worthy opponents. I was pretty shattered mentally as much as anything after it was all over. 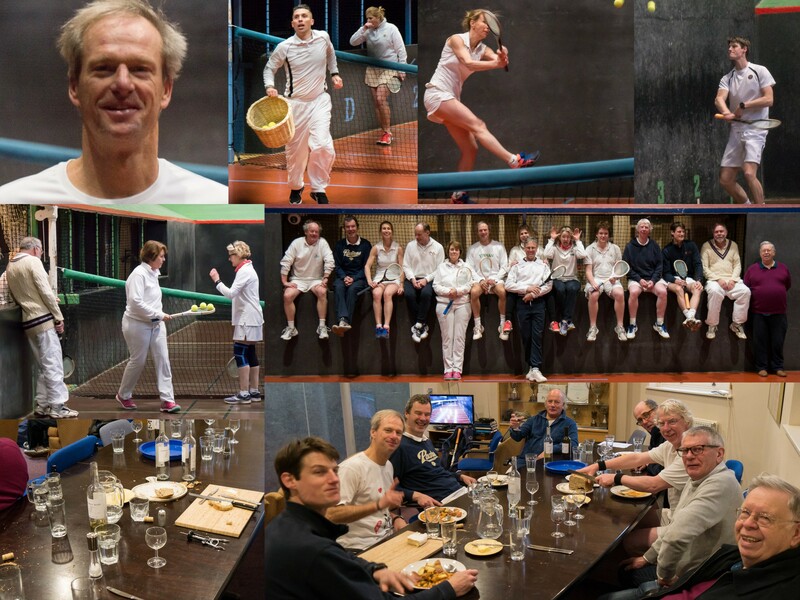 And then I had to go and do it all again in my Singles match except I lost (in the last possible game, of course). 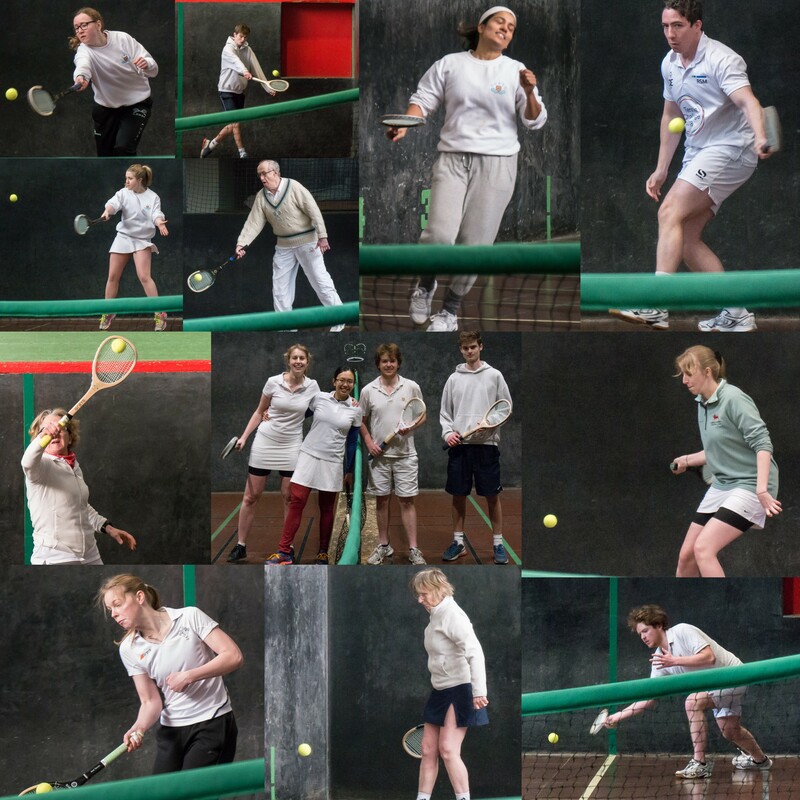 And if you want to see all the results…. here you go! 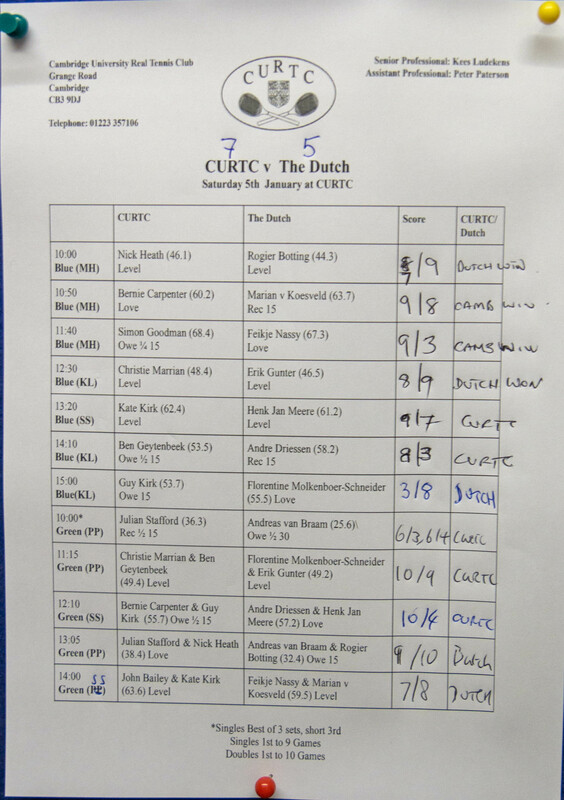 Many thanks to Peter, Simon, Mark & Kees who marked the marathon and the CURTC Juniors for their patience…. 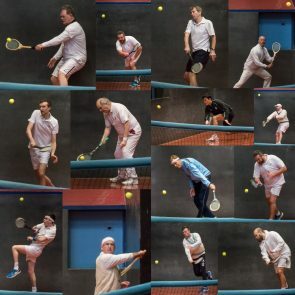 This year’s Christmas tournament was as successful as ever, with a full draw of 24 Christmas hangovers on court fighting for the coveted box of chocs. 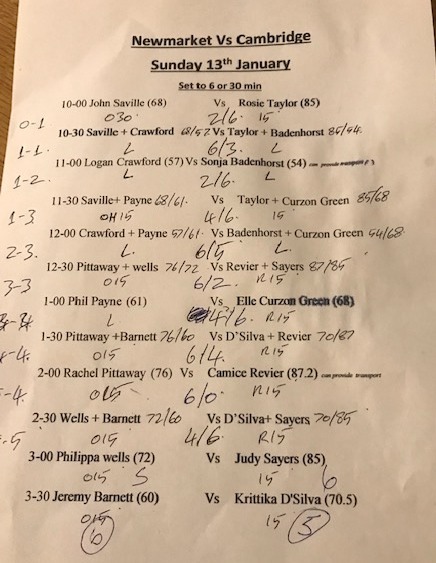 The creative format of the draw, by John Trapp, requires successful players to be able to overcome opponents of vast differences in handicap in singles matches plus the ability to coordinate effectively in new doubles pairings. Groups are formed of a low handicap, a medium handicap and a high handicap – only one player makes it though to the knockout rounds. 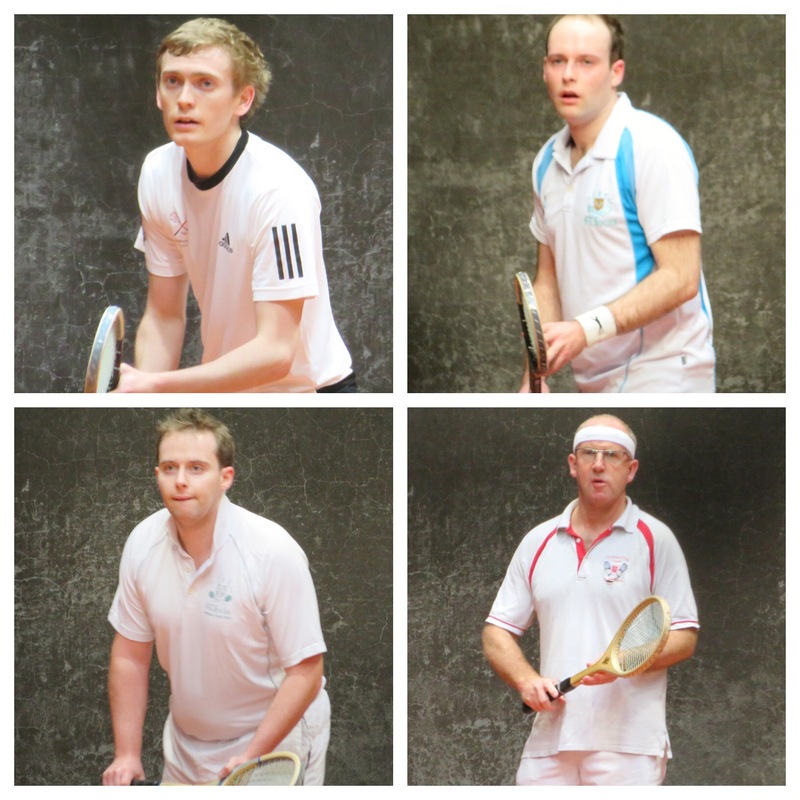 In the knock-out stage John Reid struggled with Noah Wright’s serve and Tony Kennedy couldn’t cope with Alex Peake’s energy, setting up the semi between Alex and Noah in which Alex won 6-2. 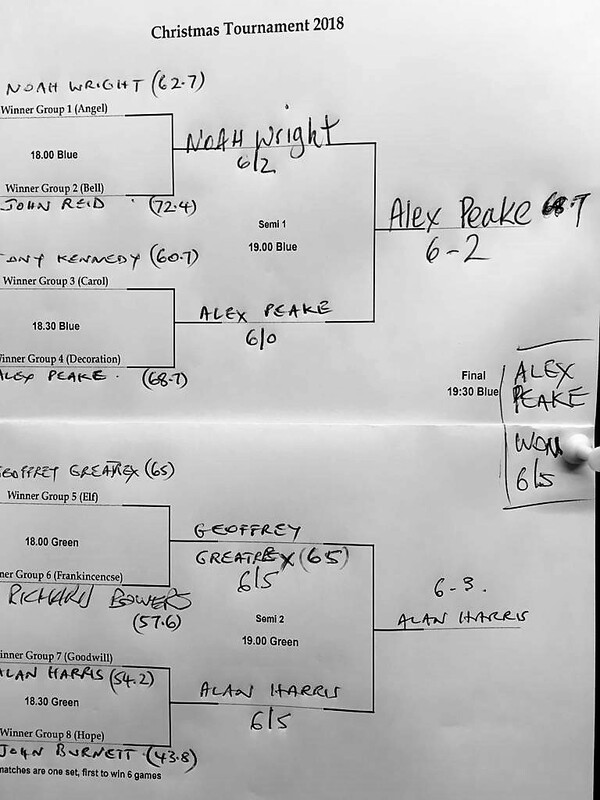 In the bottom half of the draw Geoffrey Greatrex defeated Richard Bowers on match point for both players, and Alan Harris (who gallantly stood in for the group winner Jeremy F) also won 6/5 versus John Burnett. Alan’s smooth swing and calm movement allowed him to conserve his energy and win 6/3 against the tiring Geoffrey. 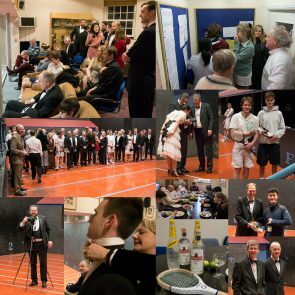 For a further year the final was viewed by family members trying to remain unbiased with their applause but quietly hoping to return home with the box of Lindt. 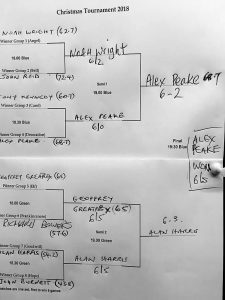 After a close first game which Alan won, Alex took a strong 4-1 lead with excellent speed around the court. However, Alan calmly came back to make it 5-all. 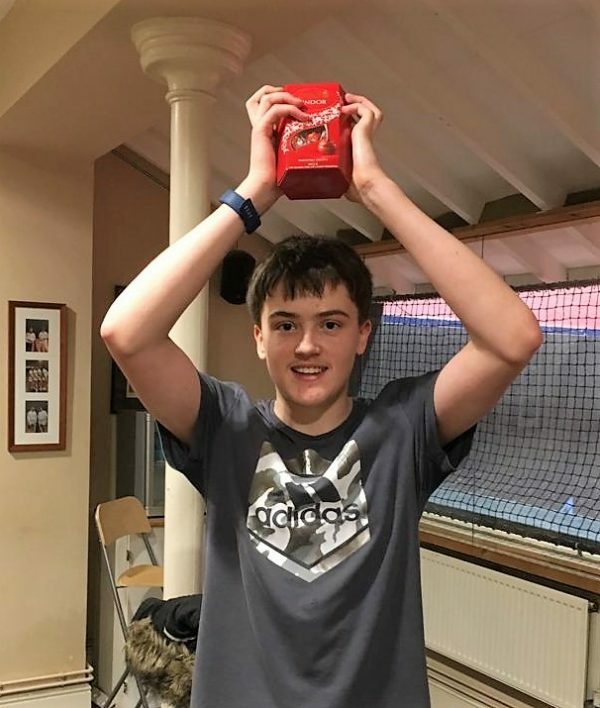 The 15 year old Alex almost lost his opportunity as the handicap in the final game was now providing Alan with less of a disadvantage, but Alex showed his desire for the prize and attacked consistently for the dedans, which proved a winning strategy. 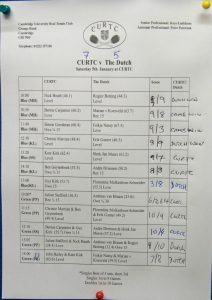 CURTC’s winning streak came to an end on December 13th away at Newmarket. 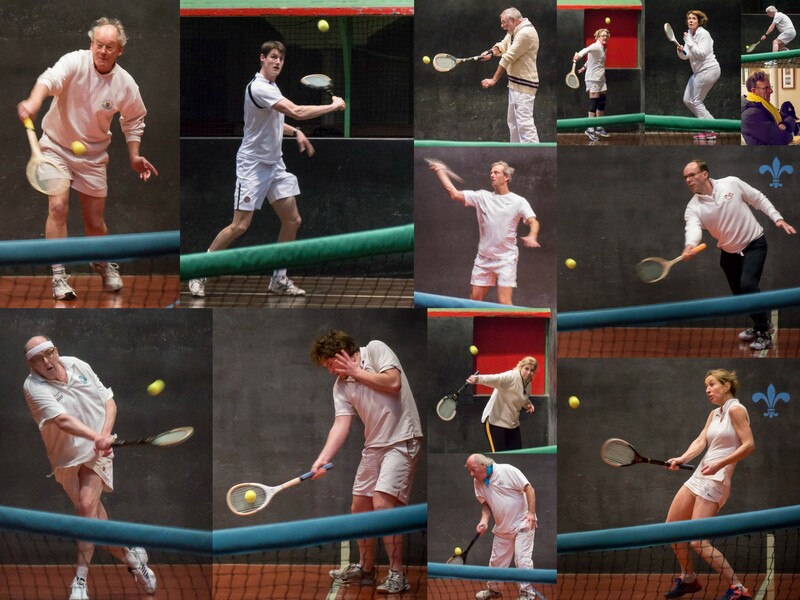 The team lost 4-2 (but there is a home leg to redeem ourselves). 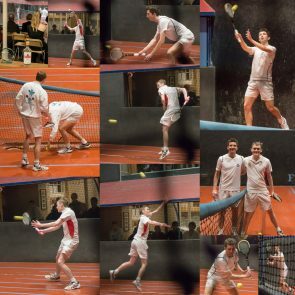 In spite of some very promising starts, the team was rarely able to clinch victory. However, we retain 2nd place in the League with an important match against the current leaders on January 10th. I guess, not much has changed in the intervening centuries beyond the benefits now being available to both men and women and no longer restricted to the young. 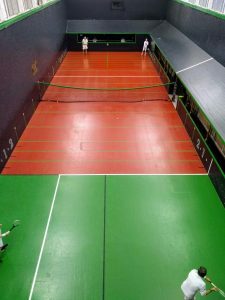 The court is huge but quite bouncy so getting a hazard chase proved surprisingly (depressingly??) easy, as I was to discover. 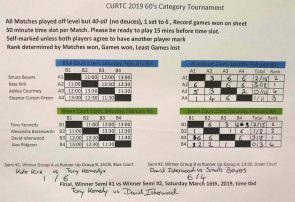 CURTC’s day had started brightly on both the trains and the M25. The brightness continued as Jo & Dave overcame a major handicap disadvantage and two spirited opponents and we moved smoothly through the first set and to a 5-3 lead in the second. What could possibly go wrong, you dear reader, and those in the Dedans could reasonably ask? Lunch it appears. The Dedans emptied and so did our fortunes. This sadly presaged a rather dramatic change in CURTC’s day as the G-Men took a bit too long to come to grips with the Court. However, to be honest I did not see much more than the last point of their match as I was discovering quite how splendid the lunching arrangements were both in the Club and the neighbouring Palace. TK & Andy also struggled although it did give me an opportunity to take a photo showing quite how large the court seems. 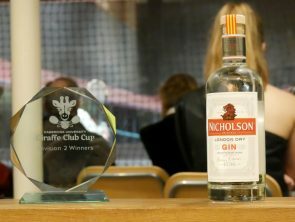 Cambridge move on to the semi-finals following a 3-2 win at Moreton Morrell. Thanks to Keith Beechener for the pix!